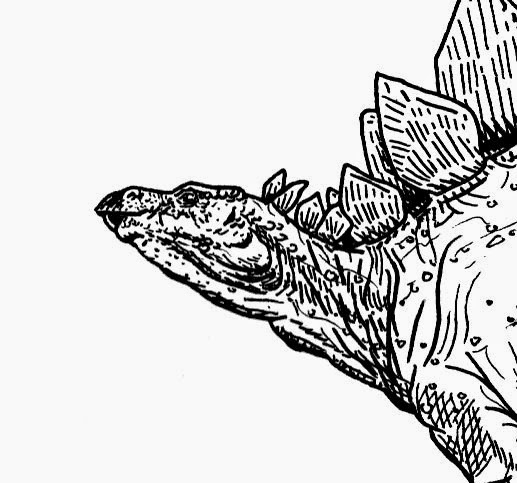 Detail of Figure One: Stegosaurus, ink on Bristol board paper. Last spring, my amazing friends Ben and Ashley were eagerly awaiting the birth of their son, Max. They hired me to do four original illustrations for Max's nursery. I was honored and thrilled! They wanted them to be of dinosaurs! I was super excited! After lots of fun discussions on the phone and messages back and forth, we settled on which dinosaurs and styles to use. Two of the pieces were to be black and white ink drawings and the other two would be watercolor paintings. 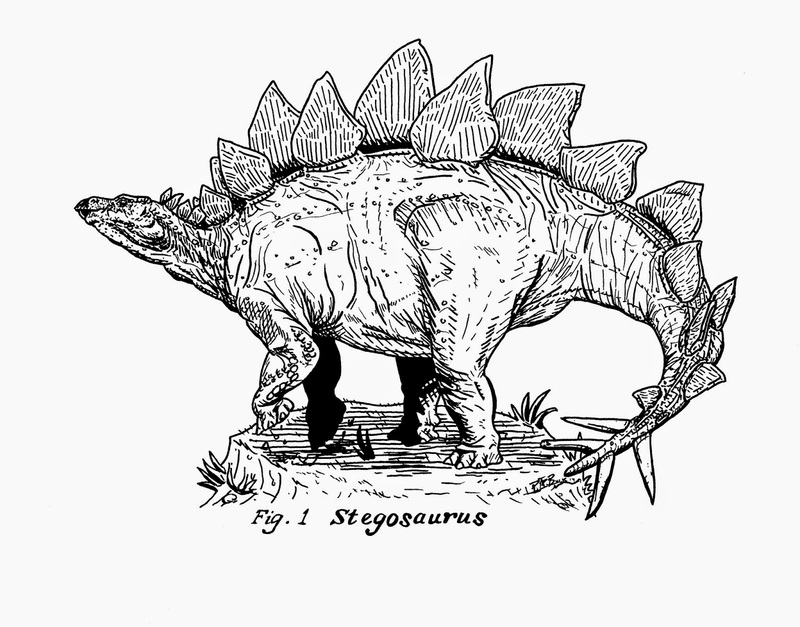 Here is a quick look at how I made the ink drawing, Figure One: Stegosaurus. I searched through many books and websites for reference and found many great sculptures, paintings, and stegosaurus fossils. I even broke out my old toy dinosaurs from when I was a kid and used the stegosaurus you see below for reference too! I tried take the approach that this was a drawing in an old encyclopedia or maybe in the field journal of a scientist or explorer who stumbled upon a living stegosaurus! After doing a lot of sketches of stegosaurs in different positions and compositions, I was ready to move on and start the final piece. View from the desk: Pencilling in the finished piece. As you can see above, it's often my custom to surround the artwork I'm currently working on with my preliminary sketches and any other reference I think might be handy to refer back to while working. I lightly penciled in the dinosaur and then inked it over top. It's been a little while, but I believe I used various sizes of Faber-Castell PITT artist pens for most of the inking. Figure One: Stegosaurus, final piece, ink on 9.5" x 7.5" Bristol board paper. After completing this ink drawing and the second one, Ben and Ashley were kind enough to give me the "OK" to use scans of the drawings as designs for t-shirts and other products over at my Society6 shop. You can check them out and purchase any you'd that you like HERE. The MAX. 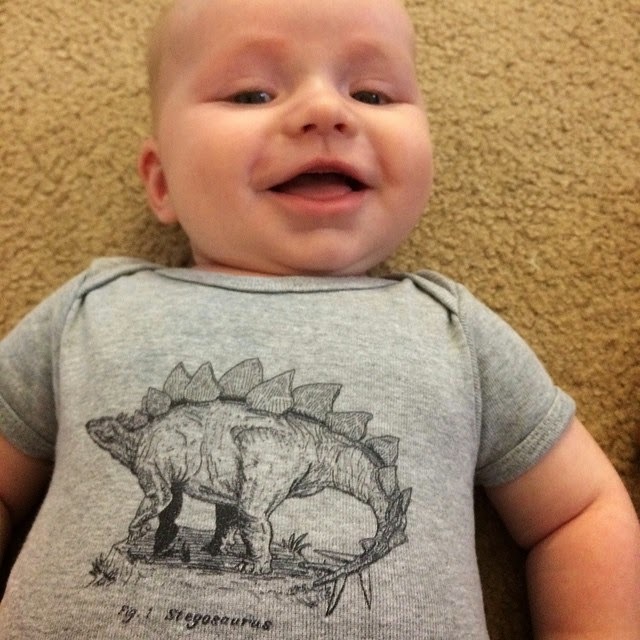 A happy and cool dude sporting his stegosaurus drawing on his new onesie. You can even do what Ben & Ashley did and get your baby a stegosaurus onesie! Max seems to dig it! He is such a cool kid. I can't begin to describe how much fun I had on this project! I'll be posting more about the other dinosaur pieces I did for Max soon! Until then, God bless!